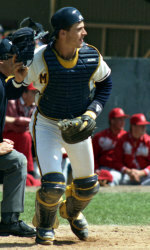 New Cardinals manager Mike Matheny played at Michigan from 1989-1991 (Courtesy MGoblue.com). ST. LOUIS, Mo. — University of Michigan alumnus and 13-year Major League Baseball veteran Mike Matheny (1989-91) was officially introduced as the 49th manager in St. Louis Cardinals history at a press conference Monday (Nov. 14). Matheny replaces Tony LaRussa, who retired after the Cardinals won the 2011 World Series in seven games over the Texas Rangers. Matheny becomes the first Wolverine alum to manage in the Major Leagues since Steve Boros (1956-57) was the skipper of both the Oakland Athletics (1983-84) and the San Diego Padres (1986). Matheny played for four teams during his Major League career and won four Gold Gloves at catcher, earning three with the Cardinals (2000, ’03, ’04) and another with the San Francisco Giants (2005). He helped the Cardinals to postseason play four times in five seasons, including a World Series appearance in 2004. Matheny also played for the Milwaukee Brewers and Toronto Blue Jays and ended his playing career with the San Francisco Giants. His best power year came with the Giants in 2005 when he hit 13 home runs and 34 doubles, drove in 59 runs and had a .406 slugging percentage. A native of Reynoldsburg, Ohio, Matheny earned the Ray L. Fisher Award (Michigan’s Most Valuable Player) and was named to the All-Big Ten Conference third team his junior year (1991) in Ann Arbor. He had 15 doubles, seven home runs, and 39 runs batted in as a co-captain. A member of the 1990 Big Ten All-Academic team, Matheny won the Ted Sizemore Award as Michigan’s top fielder as a freshman and had just one error in 174 chances in 1990. He helped Michigan to the Big Ten regular-season title and an NCAA Regional appearance in 1989. Matheny was drafted by the Milwaukee Brewers in the eighth round of the 1991 Major League Baseball First-Year Player Draft. Matheny recently visited Ann Arbor as he was the keynote speaker in the 2011 Michigan baseball banquet in May.